He looked bad, then he looked fine, and then he looked exactly how you you would want to look when you are holding a racket and standing on blades of grass. Beating the world No. 66, 29, 134, and 38 is one thing—beating Alexander Zverev, maybe the only player in the field who currently seems destined to win five majors, is another. Last year on these courts, Zverev upset Federer in one of the sweetest wins of his young career; this year he had a chance for an encore, one round later, at the final. But this Federer is not that Federer. That one, residually wobbly from knee and back issues, went down in three sets. This one flattened Zverev 6-1, 6-3 en route to his ninth Halle Open title. 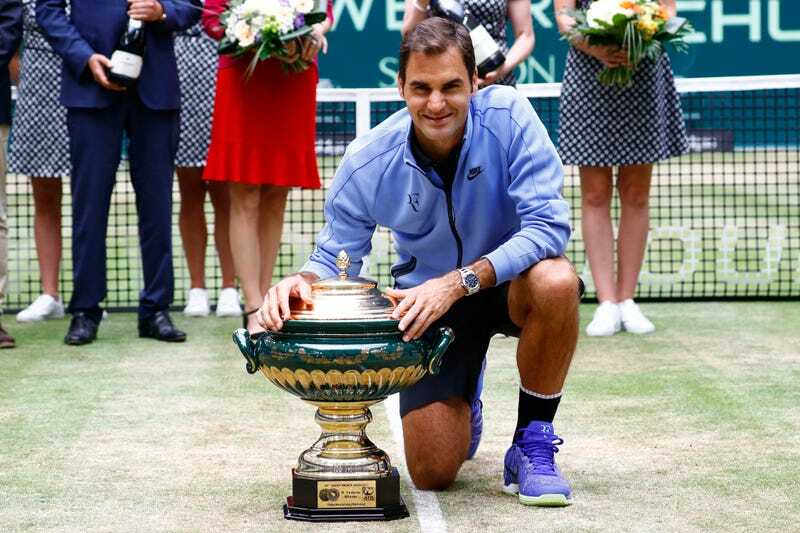 This tournament was not particularly competitive for Federer, who did not drop a set, but you could have watched it as a primer on how well the grass suits him. On the one hand, it reveals nuances that receded during the hardcourt season—which saw him mostly stepping into the court and crushing the ball from the baseline—and in other ways, simply takes his hyper-aggressive style to its logical extreme. Here is a taste of extreme from his quarterfinal match: a service game that lasts just 46 seconds. Three aces and a putaway volley. Grass is generally considered fast and slippery—though there’s plenty of debate over the relative speed of surfaces, some of it smart—and this renders Federer’s serve-and-volley that much more potent. Federer won 26 of 28 first-serve points in the final. Here he can lean into his ability to land 130 mph serves on an ant’s back, and anticipate precisely where he needs to be to pluck a volley out of the air (or half-volley off the bounce), even from a tricky mid-court position. Grass plays to his strengths in much the same way that red dirt is the perfect canvas for Rafael Nadal’s topspin and relentlessness. Federer has won 87 percent of his career matches on grass, and Nadal has won 91 percent of his on clay. Federer confounded his tall foe with underspin throughout the match. Zverev, whose heavy and reliable groundstrokes recently won him his first Masters at Rome, never found a viable strategy across two sets. Even though he stands six-foot-six, his serve has yet to crystallize into something dangerous (he’s still only 20), but it was still good enough to have been broken only twice before the final. In that match alone he was broken four times. This season Roger Federer has taken on a light schedule. He skipped clay and has played only six tournaments. Four times he won the whole thing and the other two times he lost to someone ranked outside the top 100. This presents two options for stopping him at Wimbledon: Somehow free-fall down the rankings in the next week, or just hope that the biblical rains drown out the entire event.